There’s nothing more comforting to me than a plateful of spaghetti and meatballs. 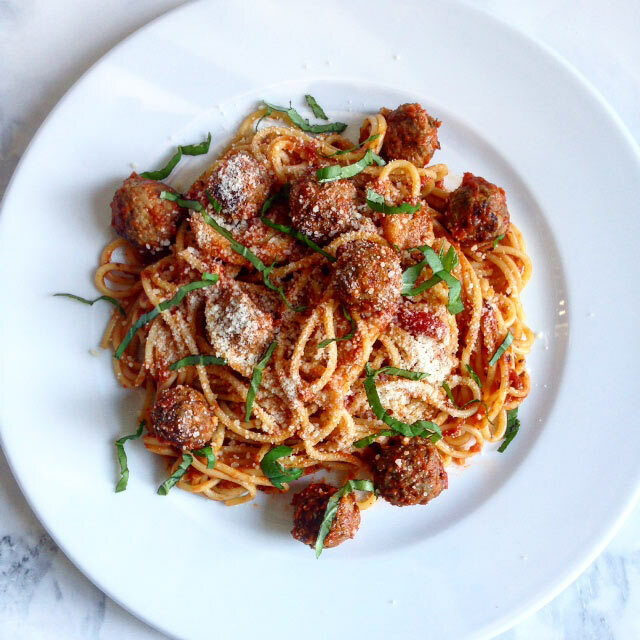 This recipe for Spaghetti with Herb Garlic Confit Marinara and Spicy Mini Meatballs is a “kicked up” version using basic ingredients along with our Herbal Fusion and Spicy Barbacoa blend. For this recipe, I used my favorite jar of @Bertolli Organic Olive Oil, Basil and Garlic pasta sauce and an extra can of Hunt’s Sauce. Honestly, the only time I actually want to make homemade sauce is in the wintertime. Therefore if it were there for the taking, my re-heated sauce would’ve definitely been used. Use a jar of sauce you love and incorporate it into this recipe if the freezer bears no signs of homemade sauce. And lastly, the garlic confit (I happened to have on hand,) was previously made weeks ago when the extra time allowed. By making the garlic confit in advance, I can vouch that it keeps well in the fridge for a long time and you’ll use it for so many other recipes too. Believe it or not, these babies were made several months ago and kept in the freezer until a time that seemed fit… like this time. I simply removed them and dumped them in with my sauce and let them heat through. One pound of Barilla spaghetti was cooked in 10 minutes and dinner was served. “Do you cook dinner every night?” The answer is, “no”. And by “no” I mean I don’t start a recipe from it’s very beginning to it’s end every night. Some nights I do, however it just depends on how much time my schedule allows. With a little planning, I can manage dinner “almost” every night. When I make homemade sauce from scratch, for example, I always make a double batch and freeze it. No shame in that game! Most everything (with some exceptions,) can be stored in the freezer… why not save yourself the extra work and effort and double the batch?! Part of my mantra is to “live re-purposefully”. Since time is a priceless commodity and seems to slip away from us so quickly, why not make meals easy enough to create…especially during the week?! Oh, and I can’t forget the spices… flavor, flavor, flavor. This plateful of pasta had just the right amount of herbs in the sauce using our Herbal Fusion blend and spiciness from our Spicy Barbacoa blend in the meatballs. A little fresh basil and grated Parmesan cheese rounded this dish out nicely, taking this weeknight meal from ordinary to extra-ordinary. Ciao! Simple ingredients and a ton of flavor will make this a repeatable pasta dish your family will love. In a large stockpot, heat both sauces with the Garlic Confit, Herbal Fusion and meatballs together on medium heat. Once sauce has come to a simmer for about 5 minutes, add the cooked spaghetti to the pot and stir until fully incorporated. Turn the heat to low and heat through. Portion spaghetti and meatballs and serve with basil and parmesan cheese.